(Bloomberg) -- Cracks are starting to show in Poland’s resolve to maintain record-low borrowing costs. 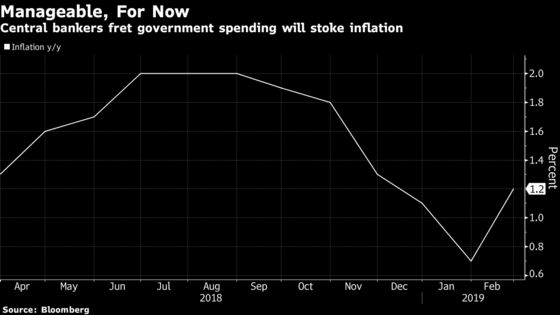 While central bank Governor Adam Glapinski has long foretold that interest rates would remain where they are for years to come, an $11 billion government spending package to win back voters before elections is causing concern. The outlays look set to juice an economy that’s already expanding at a healthy 4 percent clip. That risks feeding through to inflation, which has so far been benign. Glapinski has played down the knock-on effects of the government’s splurge and points to weaker economies in the neighboring euro area as a reason to hold steady. But interviews with some his colleagues reveal that the traditional hawkish minority on the 10-member Monetary Policy Council is gaining support. Eugeniusz Gatnar has been joined by fellow MPC members including Kamil Zubelewicz in broaching the topic of higher interest rates. Conversations during the past two weeks with three more rate-setters suggest half the panel may be of a similar mind, though Glapinski could cast a tie-breaking vote in the event of an even split. “I’m no longer convinced we’d be able to guarantee the stability of rates in the face of such aggressive fiscal policy,” Ancyparowicz said this week in Warsaw. Inflation may quicken “significantly” because of the government’s fiscal stimulus, according to Osiatynski, who steps down this year. This year, the inflationary effect of the government’s additional expenditure will be cushioned by a freeze on regulated energy prices, according to Hardt. The “full impact” of the stimulus will be felt next year.